Aliens! Whenever you want to make an action game but struggle to come up with an award-winning fabula, you can rely on the tired, overused, and always thrilling trope of the alien invasion. Rebel Twins' Aliens Drive Me Crazy is one such game, but thankfully, it's not some ad-riddled, halfheartedly slapped together mess that was kicked on Apple and Google's Play Store's to unapologetic one-star reviews. It's fun game with heaps of personality that's both content-rich and perfect for snagging a quick play. Speaking of play, playing ADMC is a blast. After the proverbial invasion plays out in a fun cut-scene, our bearded, pudgy, last-guy-you'd-expect-to-save-Earth-from protagonist is haphazardly dropped into a yellow sports-car and literally gets driven crazy by the invaders. They have taken the form of Earthly citizens, conquered a region of land that stretches across a number of districts and HQ's, and hold people hostage. What can you do? Destroy them while destroying everything in your way, of course! 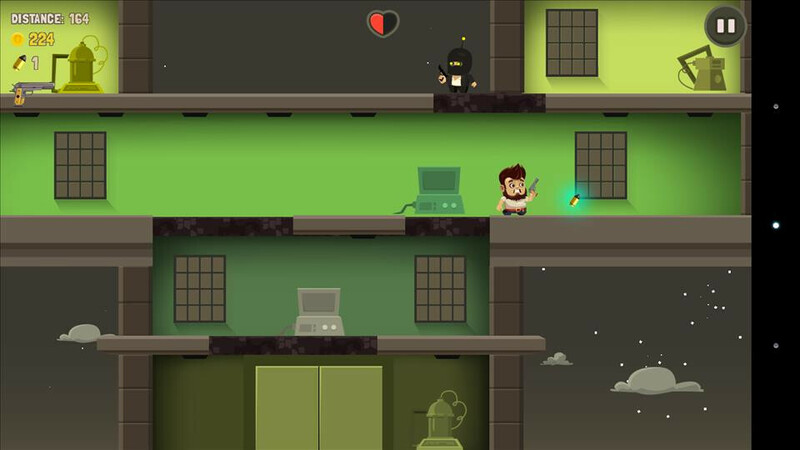 ADMC is a game that's designed to be won by purposefully awkward controls and physics. 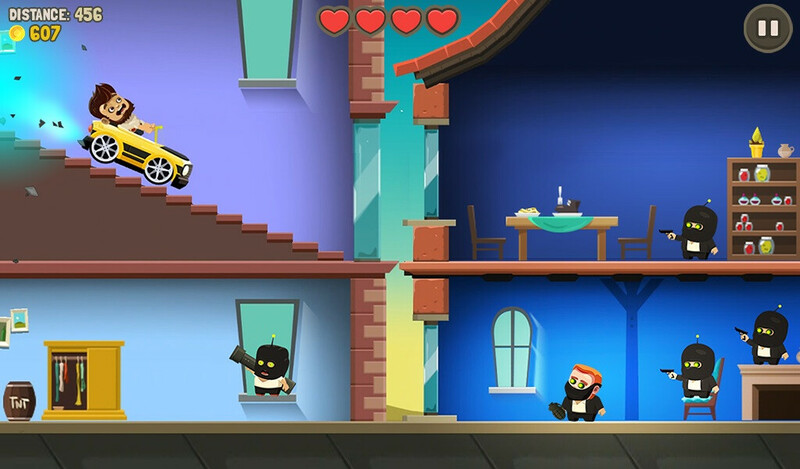 For the most part, the game runs on auto-pilot, while your interactions are limited to jumping up and jumping down straight through roofs and floors. It's like Super Mario was riding a muscle car on his way to the castle while having a lot more bricks to crush with his head. 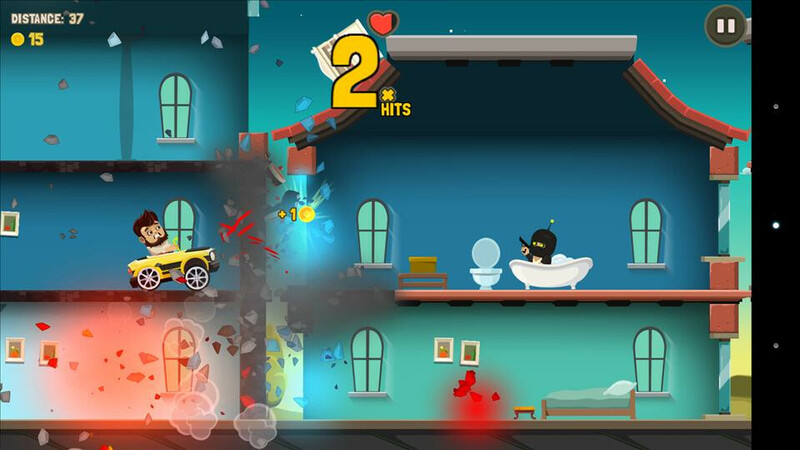 Breaking through the different floors brings mayhem to both the levels and the enemies you encounter, and just in case you felt like the game lacks something in the destruction department, the level designers have riddled the levels with TNT barrels, which ensures an explosive outcome to every maneuver. 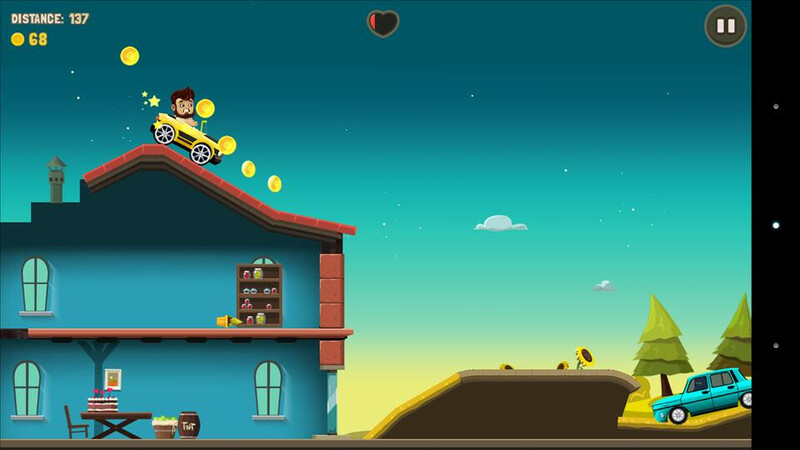 On your way to every district's HQ, you are able to pick up gold coins, which you can spend on various upgrades – new cars, weapons, character suits, and more. Entering an HQ sees our inept, but destructive protagonist step out of the vehicle and bring the fight to the alien threat on two feet. Armed with a crossbow, which does enough damage to the invaders to be completely useless against them and make you wish for something with more oomph, he must dodge bullets and destroy walls with his bare head to free a number of hostages and destroy the alien beacon on top of the building. For some reason, the operation sees the whole building collapse to the ground in the end, but if that's what it takes to save Earth, we'll have it that way. Beware, though – before letting you truck onto the next district, some of the HQ's need you to deal with giant bosses! You know, the ones that occupy half the screen and sport multiple health bars, while firing a complete arsenal of bullets, lasers and rockets at your sorry self. Expect to face armed to the teeth flying saucers, an dinosaur robot, and other staples of intergalactic military. Fighting the huge bosses and freeing hostages reminded us of the good old Metal Slug series, and any game that does that is good at what it aims for. Well-executed, blissfully chaotic gameplay aside, Aliens Drive Me Crazy features a hilarious, cartoony presentation that feels natural to the experience. 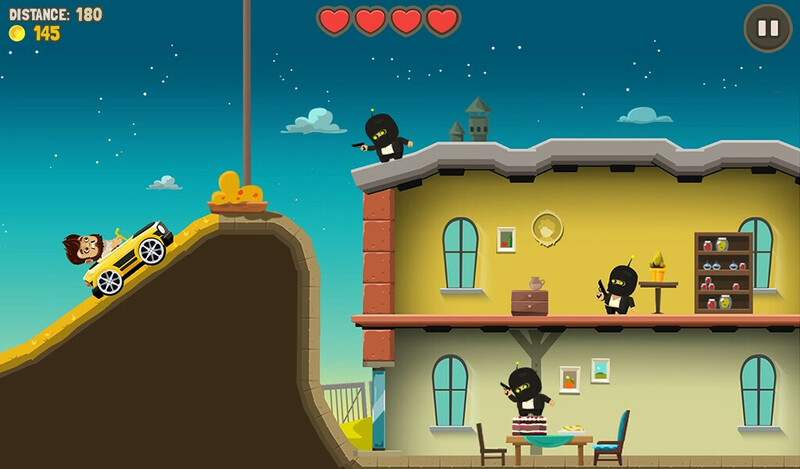 While the overall style does seem to be overly cute and self-ironic, it doesn't feel like emptying bags of sugar into your eye-sockets like most light-hearted mobile games on the market. It matches the game's slapstick tone nicely, and the quality of the art and assets is top-notch. The same can be said for the game's B-movie soundtrack, although the themes are shortget repetitive very soon. As a whole, Aliens Drive Me Crazy is a fun ride if you don't take gaming very seriously. What we felt was charmingly dumb, chaotic gameplay could stand for a glitchy, buggy mess if you aren't able to go along and have fun with it. Tastes aside, the game shines with its ability to keep you entertained on both short and long bursts, making it perfect for almost any times you may wish to kill with your smartphone. 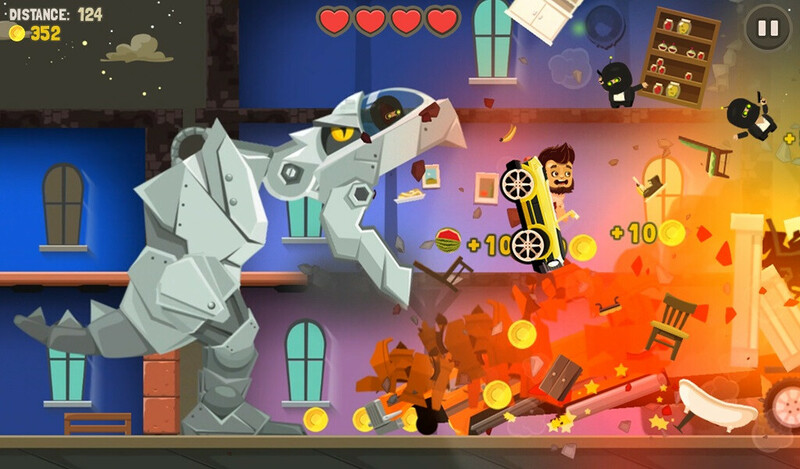 Aliens Drive Me Crazy is available on iOS and Android. 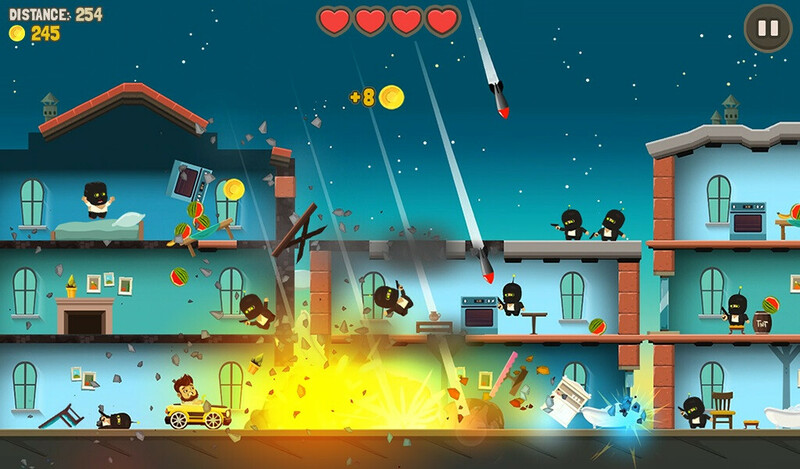 The iOS version costs $1.99, while the Android version is free to play with ads, which can be removed with a single payment.